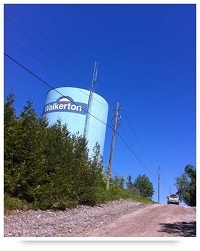 The Municipality of Brockton operates three water systems in Ontario, Canada, including the system at Walkerton, Ontario. Even without taking water temperature measurements, the utility was certain that the 70-foot-tall standpipe on the north end of their Walkerton water system was thermally stratifed during summer months. They also noticed that taste and odor complaints, while infrequent, would go up during summer months, and suspected the two problems were related. The utility purchased one mixer and installed it in the North Standpipe. They also installed temperature probes to verify that the mixer improved conditions inside the tank. After turning on the mixer, the operators at Walkerton watched as thermal stratification was eliminated from their standpipe in only a few days.